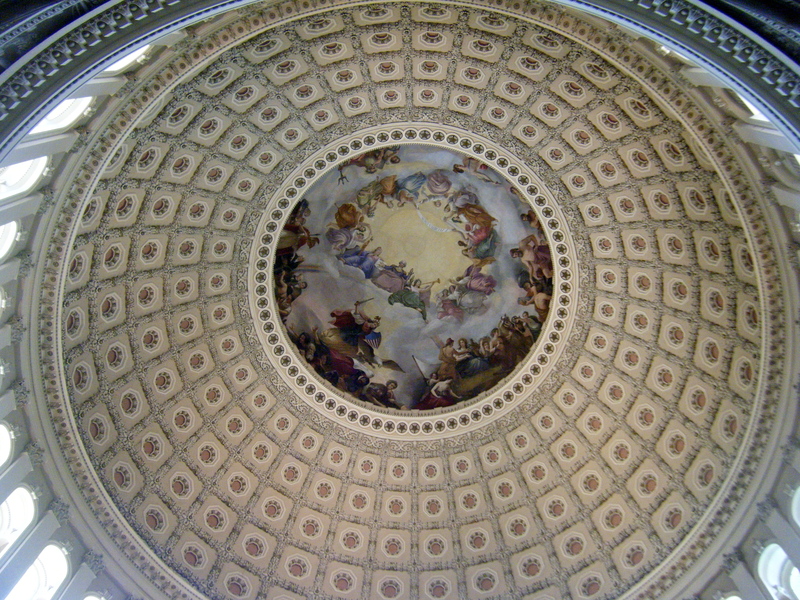 Inside of the Capitol dome, featuring the Apotheosis of George Washington. I went on a Capitol tour on Saturday which is pretty much the most blog-worthy event of the weekend (my best friend Jenna came down and while we had a lot of fun, it was more in just enjoying each other’s company). I was pretty excited for the tour because I had not yet been inside the Capitol, unlike most of my fellow interns, who are congressional interns and thus known the Capitol intimately (they even give tours themselves!). So I was particularly glad Jenna was coming to visit, since that gave me an excuse to go on a Capitol tour. We made tour reservations online, and after checking in and receiving our official tour stickers we waited for our tour time to roll around. The first thing we had to do was sit through a short film on the history of the nation and of Congress. I was expecting some sort of America! Yeah! propaganda, but it was actually a pretty well-made film and I could see it being fairly helpful for people for whom high school civics classes are a distant memory. After that, we were sorted into lines and given a set of headphones that amplified a microphone connected to our respective tour guide. It’s a pretty smart system – you can always hear your guide even if you’re not up front, and it eliminates distractions from hearing other nearby tour groups. 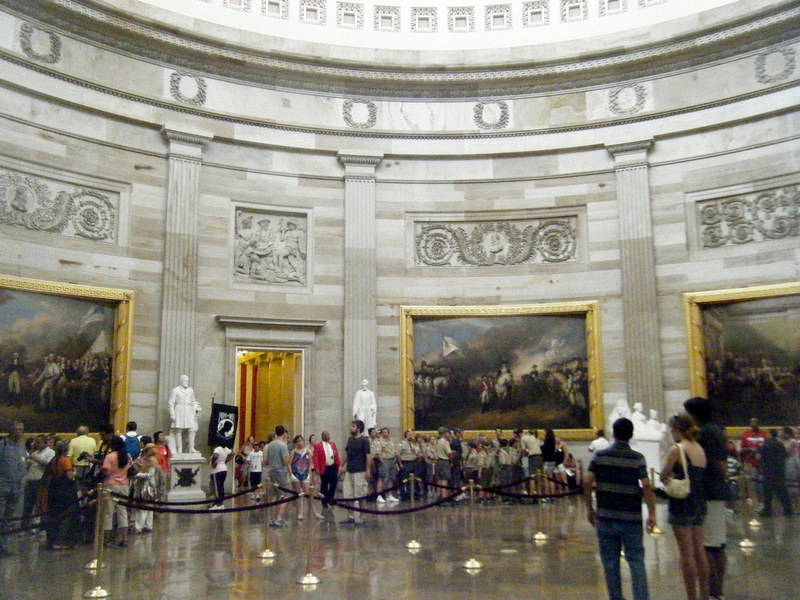 The Capitol dome used to only be as high as the lip just above the painting. And it is a painting, not a relief - it was deliberately painted to look three dimensional. Ooh! The tour itself wasn’t very long or extensive, which is probably good for some people but I would have liked to have seen more. 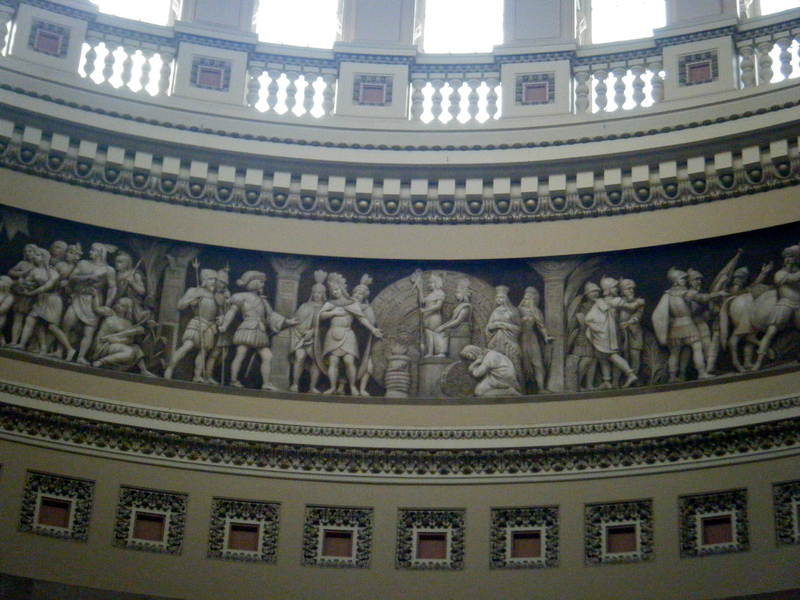 But getting to see the Rotunda is probably worth doing a tour alone – very spacious, pretty and historical. 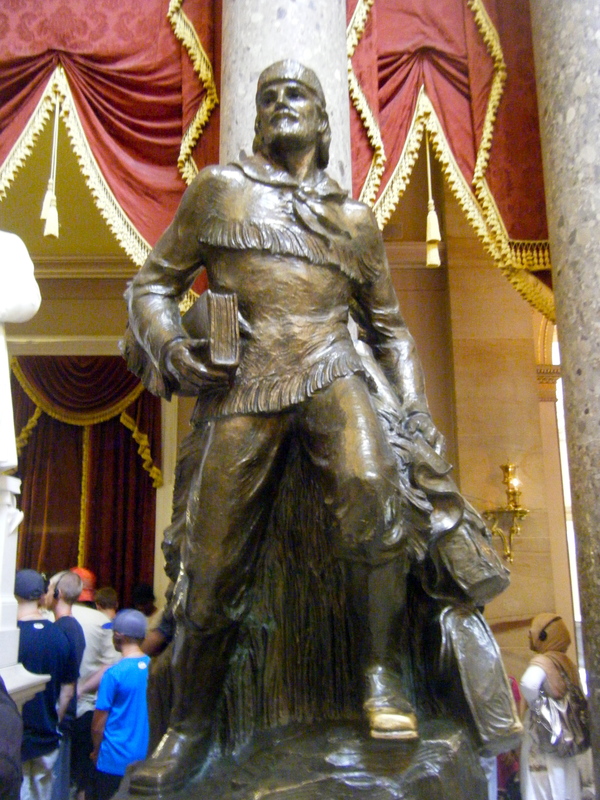 One aspect of the Capitol that’s kind of fun is that every state gets to place two statues of prominent natives of that state in the Capitol. I know Wisconsin has a Pere Marquette statue (Marquette University’s namesake) but I didn’t see it. I did see one of Washington’s, Marcus Whitman, whom I had never heard of. I have since learned he was some sort of missionary/explorer (his statue wears a coonskin hat, naturally) for whom Whitman College was named. Apparently Washington’s other statue is Mother Joseph – wish I could have found her for my mom! I didn’t pay as much attention to the tour as I probably should have. I’ve just gotten so used to being able to see DC at my speed (I haven’t done any sort of tour since I’ve been here) that I like to wander and take time to look at things, but you don’t really have that luxury on a Capitol tour. But I did absorb some tidbits, like the fact that the Capitol Dome used to be much lower (see picture above) or that there is a tomb beneath the Capitol intended for George Washington, although he isn’t actually buried there (neither he nor his family wanted it). The tour was definitely worth it. It was nice to finally step inside a building I walk past almost every day, and to do so with my intern hat taken off – I could just be a gawky tourist and not care about looking like I’m a seasoned DC veteran. 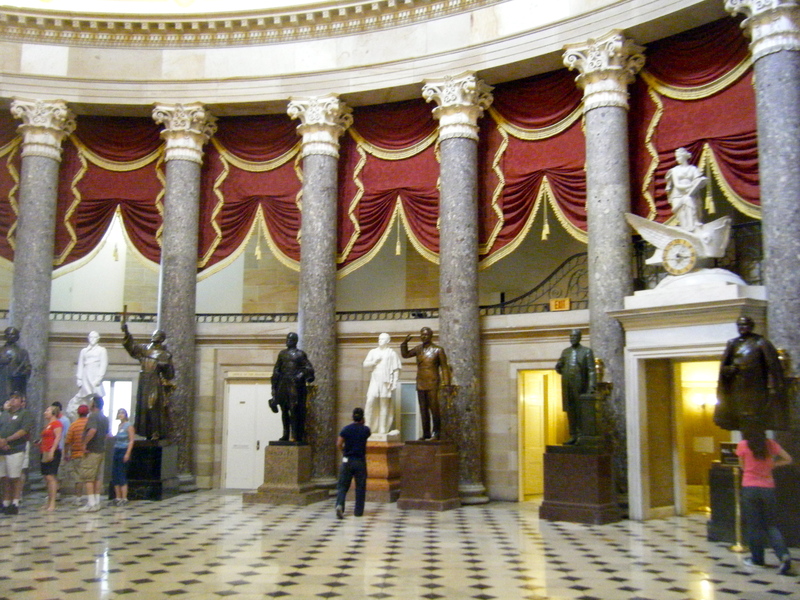 Statuary Hall (not all the statues are located in here, but a bunch are). Marcus Whitman. I bet he speaks authentic frontier gibberish! I am not sure what that is in response to…? Or is it just some sort of exclamation?